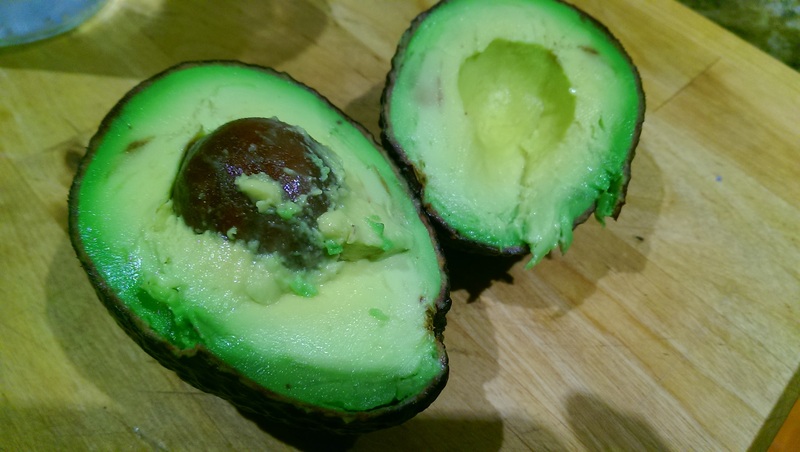 I started this blog earlier this year as embarked on a “smart start” whole30-like program. I was needing a change in my life – needing to challenge myself to think differently. And it worked. I quit my job, found a job that is more compatible with my current life, changed my eating habits, rediscovered my passion in the kitchen and have been inventing recipes left and right. I have been backlogged on writing posts on my most recent creations – and I will post those soon – but I knew it was time to challenge myself again, foodwise and to get out of this rut I am stuck in. So when a friend proposed the Whole30, I was all over it. Day one is tomorrow and I had meals planned based on a vegetarian Whole30 for the rest of the week. But of course, all that planning forgot to take into account my schedule…first preschool field trip for my little one, and I am chaperoning. Tomorrow. Early morning. On day one of the food challenge. Soup was the worst possible thing I could make for a lunch on a school bus. So it was time to create. Sandwich was the first thing that came to my mind…without bread made only with whole foods. So I made a mayo-less egg salad using avocado, spices and veg wrapped in lettuce topped with avocado, fennel and sunflower seeds. Even at the last minute, you can find something to eat and not cheat. Stock your fridge with whole fresh foods. Keep pantries full of seeds and nuts. Keep spices fresh and keep appropriate condiments – oils, vinegars, and ghee – available. This year I marked my sixth year in Los Angeles. I miss New York City more than I can express, but I find that there is so much that LA provides me with that I could not get at home. Like this. Mashed, it makes the perfect mayo replacement. Add a few spices (cumin and tumeric) and acids (lemon and vinegar to give it that earthy yet sweet and bright flavor that mustard gives without the additives and sugar often found in a processed mustard. I use coconut vinegar – but a white, apple cider or red wine would work and are still compliant. Add cayenne and paprika for heat. Salt, garlic and shallot for flavor. You can use scallion or red onion instead of shallot. 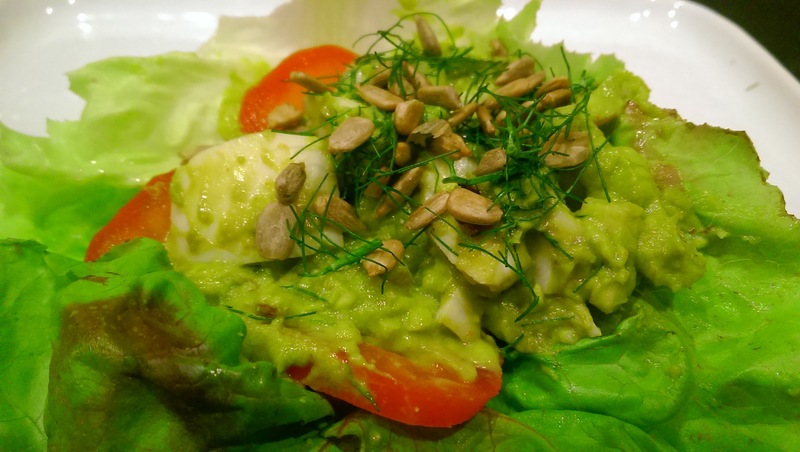 I like my egg salads with a bit of crunch – eggs and avocado are so soft, without the texture of bread to give it something other than softness, a bit of crunch makes it more pleasurable in my opinion. 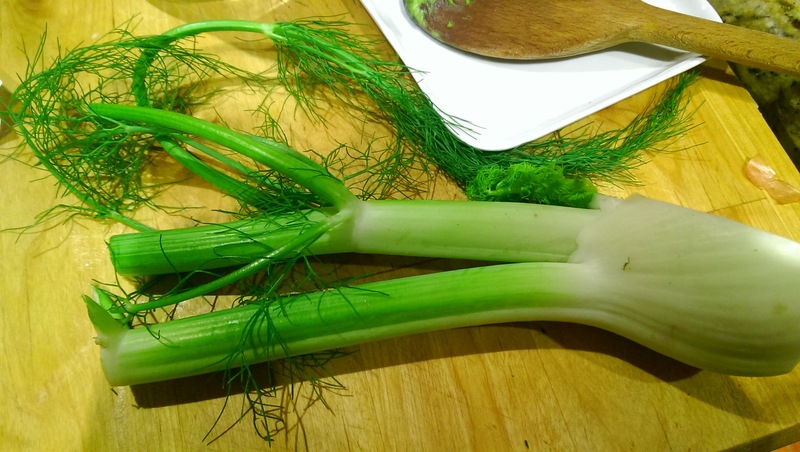 I had fennel in the fridge which gives it both crunch, from the bulb chopped up and green garnish from the fronds. You can use celery for crunch and cilantro or sprouts for garnish if you can’t find fennel. And finally I used pasture-raised hardboiled eggs. Pasture-raised eggs are much more expensive, but after watching vegucated, I don’t think I can stomach a non-pastured raised chicken for eggs (and no, cage-free is not the same…highly recommend watching this funny and educational documentary). 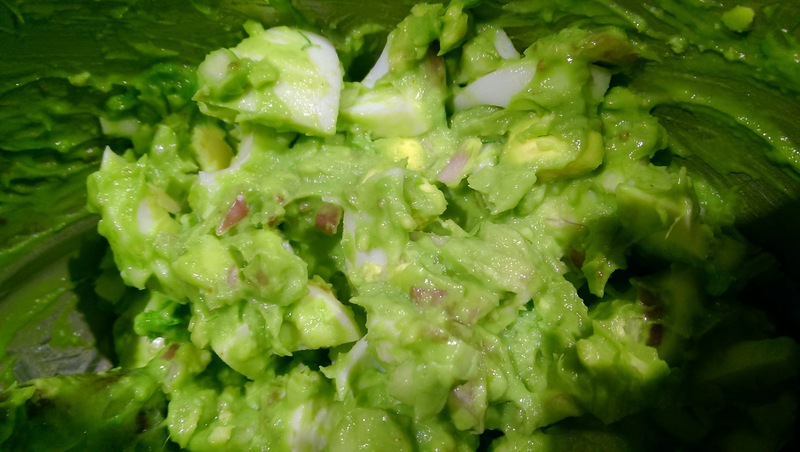 I halved the eggs and then cu teach half into six pieces each and folded into the avocado mix. The salad is so tasty, light and fresh. Using a boston lettuce leaf, layered with tomato, topped with the salad and garnished with fennel fronds and sunflower seeds I made a wrap – I couldn’t help myself, I ate a wrap before I packed my lunch…the sunflower seeds gave it additional texture, protein and flavor. SO good. i would toast them to give them additional flavor but I risk loosing some nutrition, so I left them raw. It was amazing fresh, but the flavors will mingle overnight and deepen. To store the salad, make sure that saran wrap completely covers the salad, touching the salad on all sides so that there is no air between the salad and saran wrap – this will help to reduce oxidation and browning of the avocado. Try it out, play with spices and garnishes. Keep whole foods in the fridge and you will never have an excuse to cheat. especially on day one. 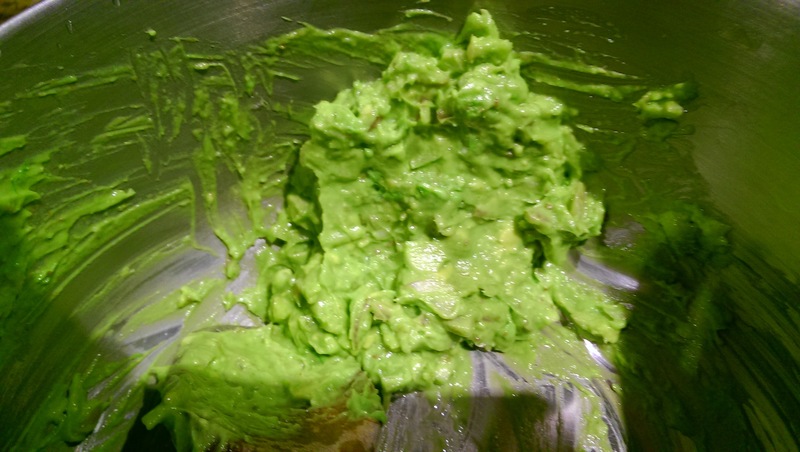 Mash avocado in a bowl until smooth. Add in cumin, cayenne, paprika, salt, tumeric, lemon juice and vinegar and mix thoroughly. 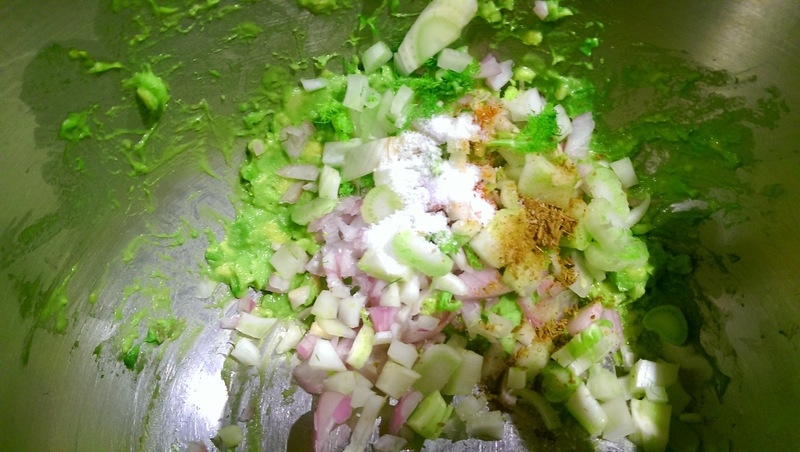 Add in shallot, garlic and fennel and mix. Fold in eggs. Serve in lettuce, with tomato and garnish with fennel fronds and sunflower seeds. If saving for later, store in fridge with saran wrap pushed down on egg salad so it is sealed in without any exposure to air to prevent browning of avocado.